Thanks to the dedication of fellow Seibertron user and YouTube transformers reviewer, Chuckdawg1999 has done a review of the recently released Takara Tomy Transformers Legends Big Powered set! The set contains the three Powered Masters that were the heroes of Transformers Zone, which was a Japanese only installment of the franchise, which had its story told through a short Original Video Animation and through story pages in TV magazines. The three toys are extensive retools of toys released during Titans Returns (Dai Atlas was Sky Shadow, Sonic Bomber was Misfire, Road fire was Twin Twist). 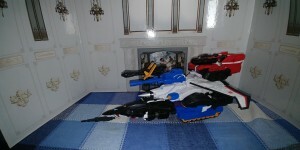 Part of the retooling was done to allow them to combine like the original toys. Check out Chuckdawg1999's review below (embedded for your convenience) and see what he has to say about this release. Chuckdawg1999 wrote: The Big Powered gift set from the Takara Legends line features three HEAVILY retooled Titans Return figures reimagined into Dai Atlas, Roadfire, and Sonicbomber. All three figures feature a "Base" mode and can combine together like the legendary G1 toy. If you don't have an interest in the Japanese history of G1 this might be a pass, but for the rest of us, this set is a must-have. What do you think of this update to Japanese G1 history? Do you agree with the review? Let us know in the Energon Pub and stay tuned to Seibertron for all the latest news and reviews! i just got mine today! and its freaking awesome! Can the jumpstarters combine with vehicle mode like in the included comic, or is just place them next to it invehicle mode for effect? blackeyedprime wrote: Can the jumpstarters combine with vehicle mode like in the included comic, or is just place them next to it invehicle mode for effect? Though, no one (that I've seen so far) has posted a pic of the five-Powered Master robot mode combination. Thanks all, just played about with my takara ones (since I'm yet to to find hasbro Twintwist, Misfire & Windblade) and they have plenty of holes in them which made for a few minutes of play with Cog. There is a way to combine all 5 in robot mode? It's more a way to attach the four Deluxes in vehicle mode to Dai Atlas in robot mode. The high quality scans of Dai Atlas's comic (now visible in the Legends manga thread) show this configuration in the bottom-left corner of the final page. well shoot...There's two more toys I didn't think I'd ever want I can add to the list. Depending on how cool it actually looks in Robot form....So Whats least expensive these days?... a Legends Twin Twist, or a TR Twin Twist on eBay? well shoot...There's two more toys I didn't think I'd ever want I can add to the list. Depending on how cool it actually looks in toy form....So Whats least expensive these days?... a Legends Twin Twist, or a TR Twin Twist on eBay? Hasbro on ebay. The Legends toys now are ridiculously expensive and hard to find because they also included exclusive targetmasters (which are proving to be better than the battle masters we are getting now). You think the Targetmasters are better? The Battlemasters are solid plastic not clear and peg together more securely. chuckdawg1999 wrote: You think the Targetmasters are better? The Battlemasters are solid plastic not clear and peg together more securely. I honestly dont think either are great. But I do preffer the articulation on the Takara one I have since it has knees. From what I read, it seems fans are preferring the takara ones. Just remember they're clear plastic, the more you play with them it's a matter of if not when they'll break. I will say that I don't see we'll see the Targetmasters like Kup's done as Battlemasters. I much prefer the Takara Targetmasters too. The new Siege ones are okay, but don't quite have the level of articulation, engineering, and most importantly, accurate paint applications and color layouts, of the Legends ones. I'm mainly getting the Siege Battle Masters for the animal characters and the weapon special effects pieces. I'll be mixing and matching parts from the various humanoid Battle Masters to create more obscure characters, like a proper "Nebulan" for the upcoming Generations Selects Ricochet/Stepper figure. Wolfman Jake wrote: I'm mainly getting the Siege Battle Masters for the animal characters and the weapon special effects pieces. Same here. Also, I really dont fear the clear plastic in this case. It's not the thin or rigid kind used for windows and the like. it,s similar to the plastic from the power core combiner targetmasters which is pretty solid. Clear plastic is just like any other plastic. I've had plenty of thin clear plastic last forever and I've had thick clear plastic break out of no where. One of the tusks broke on my TR Repugnus, they're clear and pretty thick plastic and I haven't got a clue how aside from the plastic already being flawed. And I've had the exact same experience with solid plastic. I've never seen any reason to believe all clear plastic has the potential to become become brittle. Best to shop around, I got both Takara versions for less that what it would cost me to get Hasbro Twintwist but it might be harder to find the Legends discounted now. Emerje wrote: Clear plastic is just like any other plastic. I've had plenty of thin clear plastic last forever and I've had thick clear plastic break out of no where. One of the tusks broke on my TR Repugnus, they're clear and pretty thick plastic and I haven't got a clue how aside from the plastic already being flawed. And I've had the exact same experience with solid plastic. I've never seen any reason to believe all clear plastic has the potential to become become brittle. This right here. I've never had problems with clear plastic parts on my figures. Some figures have broken out of nowhere, like pieces cracking or crumbling when lightly touched or joints just shearing right off, but all of those cases have been with opaque plastic parts. I think that when plastic does stress, crack, or fail, it's easier to see the extent of the damage in clear plastic, since you can see flaws on all surfaces from almost any angle, as opposed to opaque plastic which can hide such damage if you're not looking in the right place. If you're looking for Twin Twist now, you're going to have to pay aftermarket prices, no matter which version you get. Retailers like TFSource and BBTS had them for several months, but now, everyone who couldn't find Titans Return Wave 5 Deluxes has bought most of them up, along with Windblade and Misfire. Legends Topspin is still easy to find at his "normal" import price of $39.99. If you hurry, though, BBTS does seem to have a few Legends Twin Twists available at that price right now, but I would jump on that as soon as possible. I just now went and bought myself both Legends Topspin and Twin Twist from RobotKingdom. My Big Powered set is still sitting my Pile of Loot on BBTS (as I'm waiting to save up some more before I make a few more purchases I need to make from BBTS before shipping), but now I've essentially got all five Legends Powered Masters.